Being able to react to market changes in an agile way is the path to the survival of your business today. As you may not nail it in the first go, the ability to correct with continuous improvement is the path for your business to stay alive. Doing business process improvement most often involves master data as examined in the post Master Data and Business Processes. The people side of this is challenging. The technology side isn’t a walkover either. When looking at Master Data Management (MDM) platforms in sales presentations it seems very easy to configure a new way of orchestrating a business process. You just drag and drop some states and transitions in a visual workflow manager. In reality, even when solely looking at the technical side, it is much more painful. MDM solutions can be hard to maneuver. You have to consider existing data and the data models where the data sits. Master data is typically used with various interfaces across many business functions and business units. There are usually many system integrations running around the MDM component in an IT landscape. A successful MDM implementation does not just cure some pain points in business processes. The solution must also be able to be maneuvered to support business agility and continuous improvement. Some of the data quality and data governance aspects of this is explored in the post Be Prepared. The intersection of Master Data Management (MDM) and Business Process Management (BPM) is a very interesting aspect of implementing MDM solutions. An example of such a business process is the execution of a direct marketing campaign. Doing this in an effective way is heavily dependent on clean and updated master data. A key capability is the ability to separate which targeted real world entities belongs to the so called “new market” and which are existing customers (or prospects or churned customers). When working with known customers the ability to intelligently relate to previously products and their categories of interest is paramount. Often knowing about the right relation between targeted parties and locations is very valuable. When doing MDM implementations and ongoing refinement the insight on how master data are used and creates value in business processes is the starting point. The most commonly mentioned wide business process is the order-to-cash process. During that process especially customer master data may be affected. A key question is whether the order is placed by a new customer or a known customer. If it truly is a new customer, then effective collection of accurate and timely master data determines the successful outcome of receiving the cash based on correct credit check, correct shipping information and more. If it is a known customer this is a chance to validate and eventually update customer master data. While customer master data often is changed through business processes having another main purpose, this is not the case with product master data. An example is from within manufacturing, distribution and retail where we have business processes with the sole purpose of enriching product master data. With the rise of customer self-service through e-commerce the data quality requirements for completeness and other data quality dimensions have increased a lot. This makes the orchestration of complex business processes for enriching product master data a whole new flavour of Business Process Management where master data itself is the outcome – of course in order to be optimally used in order-to-cash and other business processes. PS: If you are interested in discussing BPM and MDM alignment on La Rambla in Barcelona on the 22nd April 2015, here is the chance. 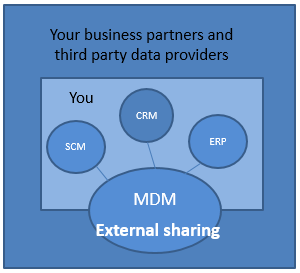 If you haven’t yet implemented a Master Data Management (MDM) solution you typically holds master data in dedicated solutions for Supply Chain Management (SCM), Enterprise Resource Planning (ERP), Customer Relation Management (CRM) and heaps of other solutions aimed at taking care of some part of your business depending on your particular industry. In this first stage some master data flows into these solutions from business partners in different ways, flows around between the solutions inside your IT landscape and flows out to business partners directly from the various solutions. The big pain in this stage is that a given real world entity may be described very different when coming in, when used inside your IT landscape and when presented by you to the outside. Additionally it is hard to measure and improve data quality and there may be several different business processes doing the same thing in an alternative way. The answer today is to implement a Master Data Management (MDM) solution. When doing that you in some degree may rearrange the way master data flows into your IT landscape, you move the emphasis on master data management from the SCM, ERP, CRM and other solutions to the MDM platform and orchestrate the internal flows differently and you are most often able to present a given real world entity in a consistent way to the outside. In this second stage you have cured the pain of inconsistent presentation of a given real world entity and as a result of that you are in a much better position to measure and control data quality. But typically you haven’t gained much in operational efficiency. You need to enter a third stage. MDM 3.0 so to speak. In this stage you extend your MDM solution to your business partners and take much more advantage of third party data providers. The master data kept by any organization is in a large degree a description of real world entities that also is digitalized by business partners and third party data providers. Therefore there are huge opportunities for reengineering your business processes for master data collection and interactive sharing of master data with mutual benefits for you and your business partners. These opportunities are touched in the post MDM 3.0 Musings. Back in 1990 Michael Hammer made a famous article called Reengineering Work: Don’t Automate, Obliterate. Indeed, while automation is a most wanted outcome of Master Data Management (MDM) implementations and many other IT enabled initiatives, you should always consider the alternative being eliminating (or simplifying). This often means thinking out of the box. PS: From the data quality and MDM world one example of making French breakfast instead of English / American breakfast is examined in the post The Good, Better and Best Way of Avoiding Duplicates. Working with data governance and data quality can be a very backward looking quest. It often revolves around how to avoid a recent data disaster or catching up with the organizational issues, the process orchestration and new technology implementations needed to support current business objectives with current data types in a better way. This may be hard enough. But you must also be prepared for the future. The growth of available data to support your business is a challenge today. Your competitors take advantage of new data sources and better exploitation of known data sources while you are sleeping. New competitors emerge with business ideas based on new ways of using data. The approach to inclusion of new data sources, data entities, data attributes and digital assets must be a part of your data governance framework and data quality capability. If you are not prepared for this, your current data quality will not only be challenged by decay of current data elements but also of not sufficiently governed new data elements or lack of business agility because you can’t include new data sources and elements in a safe way. A living business glossary that facilitates a shared understanding of new data elements within your organization including how they relate to or replaces current data elements. Configurable data quality measurement facilities, data profiling functionality and data matching tools so on-boarding every new data element doesn’t require a new data quality project. Self-service and automation being the norm for data capture and data consumption. Self-service must be governed both internally in your organization and externally as explained in the post Data Governance in the Self-Service Age. The data governance discipline, the Master Data Management (MDM) discipline and the data quality discipline are closely related and happens to be my fields of work as told in the post Data Governance, Data Quality and MDM. Every IT enabled discipline has an element of understanding people, orchestrating business processes and using technology. The mix may vary between disciplines. This is also true for the three above-mentioned disciplines. But how important is people, process and technology within these three disciplines? Are the disciplines very different in that perspective? I think so. Data governance is in my experience a lot about understanding people and less about using technology as told in the post Data Governance Tools: The New Snake Oil? I think you are really talking about data governance when putting the people argument forward in the quest for achieving adequate data quality. I see little room for having the personal opinion of different people dictating what adequate data quality is. This should really be as objective as possible. Now I am ready for your relentless criticism. Today is 2nd of December and time for the 2nd x-mas theme on this blog this year following up on the early yuletide post about The Shortcut to Lapland. In a way it is not in line with a main subject on this blog being diversity to focus too much on Christmas as I know that many readers may have for example Eid, Diwali or Chinese New Year as the main days of celebration during the year. To me The Holidays is much about having light in a time of year up north that else would be very dark and even depressive. 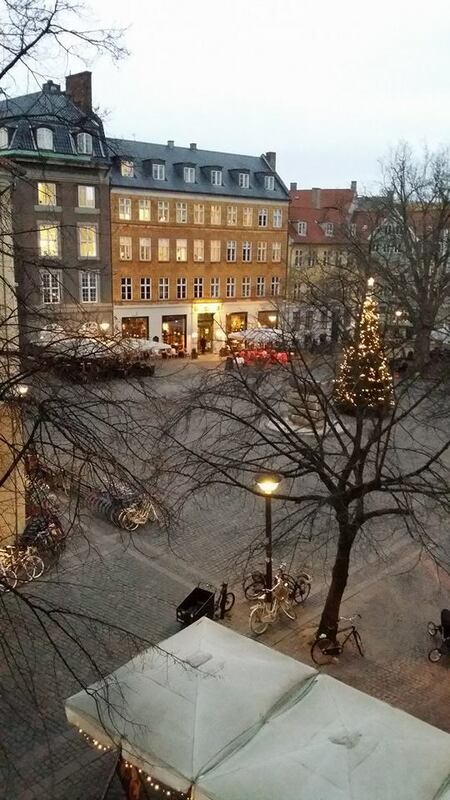 When I am in Copenhagen I live on a cosy square called Gråbrødretorv (Grey Friars Market). In summertime the square is filled with outdoor seating. Not so much in the winter. But then there is a fir tree with lights on. Gartner (the analyst firm), represented by Saul Judah, takes data quality back to basics in the recent post called Data Quality Improvement. While I agree with the sentiment around measuring the facts as expressed in the post I have cautions about relying on that everything is good when data are fit for the purpose for business operations. As said in the Gartner post data are indeed temporal. The real world changes and so does business operations. When you got your data fit for the purpose of use the business operations has changed. And when you got your data re-fit for the new purpose of use the business operations has changed again. The Gartner post mentions a data quality dimension being existence. I tend to see this as an aspect of the broader used term completeness. For example having a fit for purpose completeness related to product master data has been a huge challenge for many organizations within retail and distribution during the last years as explained in the post Customer Friendly Product Master Data. The terms omni-channel banking and omni-channel retailing are becoming popular within businesses these days. In this context omni (meaning all) is considered to be something more advanced than multi (meaning many) as in multi-channel retailing. Data management, including Master Data Management (MDM), is always a bit behind the newest business trends. In our discipline we have hardly even entered the multi stage yet. Some moons ago I wrote about multi-channel data matching on the Informatica Perspectives blog in the post Five Future Data Matching Trends. Today, on the same blog, Stephan Zoder has the post asking: Is your social media investment hampered by your “data poverty”? Herein Stephan examines the possible benefits of multi-channel data matching based on a business case within the gambling industry. Using omni in relation to MDM was seen in a vendor presentation at the Gartner MDM Summit in London last week as reported in the post Slicing the MDM Space. Omnidomain MDM was the proposed term here. The end goal should probably be something that could be coined as omni-purpose MDM. This will be about advancing MDM capabilities to cover multiple domains and embrace multiple channels in order to obtain a single view of every core entity that can be used in every business process. 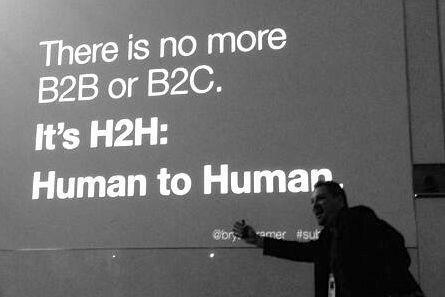 I stumbled upon an article from yesterday by Bryan Kramer called There is no more B2B or B2C: It’s Human to Human, H2H. The article is about the implications for marketing caused by the rise of social media which now finally seems to eliminate what we have known as business-to-business (B2B) and more or less merges B2B and business-to-consumer (B2C). As discussed here on the blog several times starting way back in 2009 in the post Echoes in the Database a problem with B2B indeed is that while business transactions takes place between legal entities a lot of business processes are done between employees related to the selling and buying entities. You may call that employee-to-employee (E2E), people-to-people (P2P) or indeed human-to-human (H2H). Legal entities as discussed in the post Select Company_ID from External_Source where possible. While B2B and B2C may melt together in the way we do messaging the distinction between B2B and B2C will be there in many other aspects. Even in social media we see it as for example two of the most used social networks being FaceBook and LinkedIn clearly belongs mainly to B2C and B2B respectively for marketing and social selling purposes. The different possibilities with B2B and B2C in the H2H world was touched in an interview on DataQualityPro last year: What are the Benefits of Social MDM? Getting Started in Data Governance online training from Nicola Askham is available HERE. To use Excel or not to use Excel in Product Information Management? Have a look at the eLearningCurve course on data parsing, data matching and de-duplication here.